Hypoallergenic. No parabens. Dermatologically tested. Provides the level of energy required for the skin, consistent with its daily needs and rhythm, stimulates resistance to UV radiation, accelerates skin cell renewal, resulting in a bright, healthy skin. Provides a gentle exfoliation that has the effect of regenerating the skin from the surface to the surface. Matrixyl ™ Synthe'6 stimulates the synthesis of skin collagen ferulic acid acting synergistically with the antioxidant that protects the fibers. 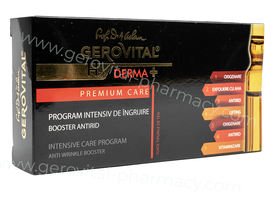 By mutual empowerment of active principles long-lasting anti-aging effects are achieved. Lifting vials contain a complex of collagen and elastin of marine origin and liposomes with hyaluronic acid, active principles that restore the extracellular matrix and improve elasticity and firmness by reducing wrinkle depth. Booster vitamin is a cocktail of vitamins A, C and E, which neutralize the harmful effects of free radicals, with beneficial effects for the regeneration of skin cells, protection of collagen and elastin to improve the hydration of improving the texture, consistency and skin brightness. We recommend using the program for at least one week a month. Each ampoule will be applied in the evening, preferably on the recommended day, on pre-cleansed skin, face, neck, neck and hands. Do not use more than one kit with 7 ampoules per week! The content of an ampoule is rolled up in the palm of your hand and applied by gentle massage with circular movements until total absorption into the skin. It does not require rinsing. After the exfoliation treatment apply the soothing protective cream. During exfoliation treatment, it is recommended to avoid exposure to the sun, the use of a high UV protective cream, the avoidance of cosmetic products with a sensitizing potential. It is recommended that the treatment be done in the sunny seasons. To protect your hands, the vial is wrapped in a napkin before it breaks. Avoid contact with eyes! ONLY FOR EXTERNAL USE! results of the efficacy studies * showed a wrinkle wrinkle decrease of up to 50% within 28 days with 1 application / day. This program can be used every week without interruption. It is important not to use more than one kit in a week.